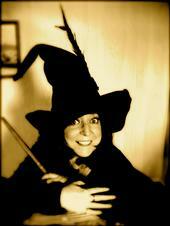 Join Henry and Beth this Saturday July the 31 at 8pm as we have the wonderful witch of the west, Marla Brooks. We will learn about her new book about Animal Spells, and Spells in the workplace. Maybe we can Put a Spell on you. This entry was posted on July 26, 2010 at 8:44 pm and is filed under Uncategorized. You can follow any responses to this entry through the RSS 2.0 feed. You can leave a response, or trackback from your own site.